Slow sand filtration is credited with being the first drinking water treatment process utilised to improve the quality of water in both modern Europe and the USA. Within the last 10 years, there has been a renaissance of interest in the potential use of enhanced processes of slow sand filtration throughout the world, especially for small and rural communities, and it continues to be the primary treatment process for many major European cities. The book deals with the latest research developments in slow sand and alternative biological filtration processes for drinking water treatment, including advances in the understanding of the fundamental mechanisms of the processes. In addition, progress in the techniques of operation and upgrading of the processes are described, with case studies from around the world. The principal themes of the book are: General overview; Removal of Natural Organic Matter (NOM), Biodegradable Organic Carbon (BOC) and Ozonation by-products; Biofilter media characteristics; Influence of process design variables and modifications; Modelling process performance; Pre-treatment applications; Operational experience and cleaning; and Upgrading treatment processes. The book also has an international perspective with case-studies from around the world. 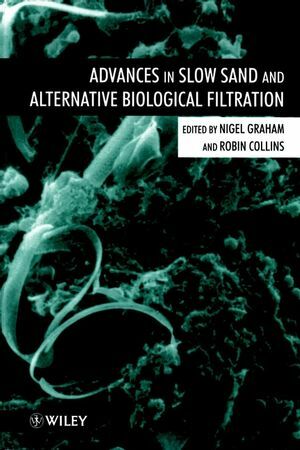 Nigel Graham and Robin Collins are the authors of Advances in Slow Sand and Alternative Biological Filtration, published by Wiley. Update on Slow Sand/Advanced Biological Filtration Research (D.Brink & S. Parks). The Significance of Protozoal Predation and Adsoprtion for theRemoval of Bacteria by Slow Sand Filtration (B. Llyod). Impact of Support Media and Properties on the Biological Treatmentof Drinking Water (B. Dussert & W. Tramposch). Dynamic Prediction of Sand Filtrate Quality (S. Shiba). Numerical Assessment of Microbial Interactions in Slow SandFiltration Modelling (C. Ojha & N. Graham). Managing Slow Sand Filters in Crisis: Some Good Comes Out of AnIndustrial Dispute ( P. Toms). ATP (Adenosine Triphosphate) Rapid Microbiology for Slow SandFiltration Optimization (A. Mackay, et al. ).